This annual event has been held for a number of years and once again, will illuminate the skies over the beautiful plateau with sparkling fireworks. Known locally as ‘Fiocchi di Luce’ it translates as flakes of light referring to the snow which surrounds the small town of Asiago in North East Italy in the heart of the Veneto mountains in the Alpine foothills. This will be a great opportunity to spend Valentine’s weekend with the ones you love in a stunning setting watching the skies overhead lit up with specialist pyrotechnics. In 2014 the world remembered the 100th anniversary of the beginning of World War I on 28th July, but here we are in 2016, in the midst of a world of geopolitical futures and the ongoing issue in Syria, peace is a fragile thing. The Flakes of Light shows are three different events which are guided by the principles of ‘Light’, ‘Peace’ and ‘Love’. Remembrance of the past dramas and conflicts and ending with a spirit of hope. Dream of the people to reflect the human condition searching for peace and to show compassion to our fellow man. Appropriately, St Valentines Day (14th Feb) has been the day to show romance, love and joy, devoting themselves to lovers to the theme just had to be LOVE. Previous years have had some of the finest exponents of the pyrotechnic craft showing their flair and expertise, including Parente Fireworks of Italy and Khan Pyrotechnics of Russia who have both listed a clutch of silverware adorning their trophy cabinets. Held in one of Spain’s largest cities, the Feria De Malaga (or fair of Malaga) has been running for the last 526 years and 2013 will once again see a fantastic program of entertainment which is certain to capture the imagination of the masses. The celebrations take place in the beautiful city of Malaga and involve the beach, monuments and of course churches. The event begins the second Friday in August during the hottest part of the year when temperatures on the Mediterranean reach a balmy 86 degrees Fahrenheit. Starting on a Friday, the celebrations last for 10-days and attract over a million visitors. 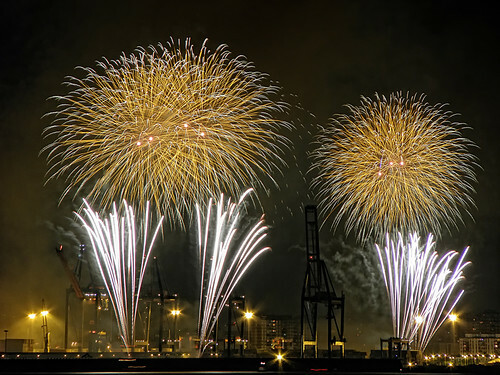 The show kicks off with a huge pyro musical fireworks display on the beach and you can enjoy the party atmosphere with food available from any of the concession stands set up on the shoreline. The entertainment is a rich and varied as the Spanish people with some dressed in traditional flamenco outfits, musical theatre groups, bars, DJ’s and much more. The fireworks display is second to none and features some spectacular shells and having been lucky enough to visit the event in 2003 with my family (whilst on holiday in Fuengirola) I have to say, with the event being on the beach front, the cool breeze off the Med (if you are lucky enough to get one) is a welcome addition. The party goes on into the wee small hours for those not taking part in the parade on the Saturday!! There is some pretty beautiful shells with hearts, faces and spaceships along with more than a couple of staggeringly large glittering sphere’s which just hang in the air as if begging to stay there which makes it difficult to choose a favourite. The show starts at 23:50 with the ‘proclamation of the fair’ and then the fireworks start at midnight to music. Every day from late morning, well into the evening the city is filled with music and traditional dancing with horses and riders adorned in traditional Andalucian costume it is a spectacular sight and one that any discerning firework enthusiast should add to their bucket list. Footage of the UK’s entries into the Philippines International Pyromusical Competition 2010. Good luck lads!! Enjoy the videos folks, we will bring you more from the other competitors as soon as we have it.